Lewes, DE (September 26, 2016) Beebe Healthcare will be offering free health screenings during the annual Frankford Health Fair, scheduled for Saturday, October 15. The community is invited to this family-friendly event, which will include flu shots by the Delaware Division of Public Health, fire trucks, helicopters (weather permitting), and more! Light refreshments will be available. 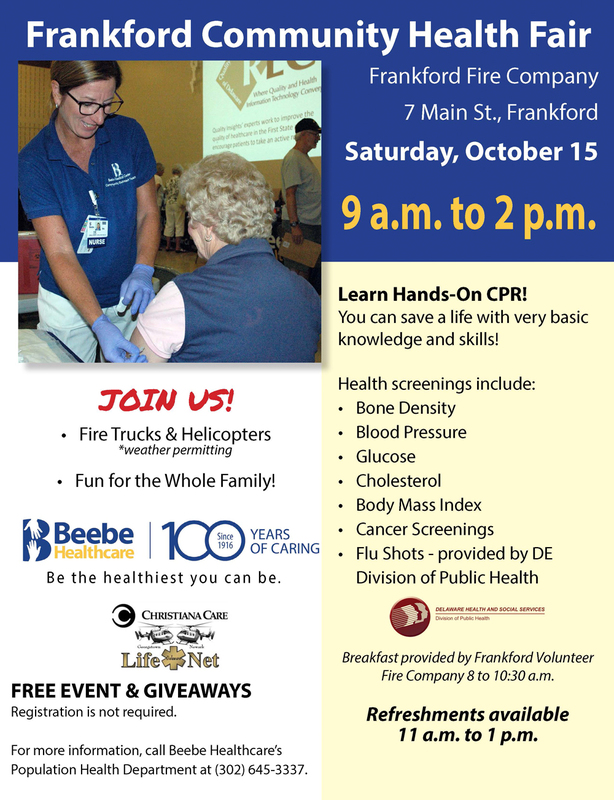 Join us Saturday, October 15, 9 a.m. to 2 p.m., at the Frankford Fire Company, 7 Main Street, Frankford. For more information, call Beebe Healthcare’s Population Health department at (302) 645-3337.